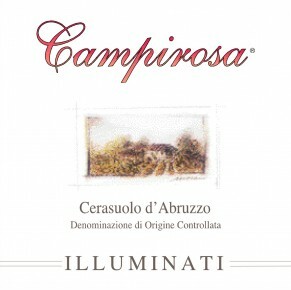 ‘Campirosa’ (literally ‘Pink Fields’) is a tasty rose’ made with 100% Montepulciano grapes. Montepulciano is the main red grape variety of the region and its rose’ version is called Cerasuolo (meaning ‘cherry’ in Italian) because of its attractive cherry-like color. Pretty floral and berry aromas follow through to the palate. Dry and fresh with a good finish. Served well chilled it will pair beautifully with appetizers, seafood dishes, grilled vegetables and grilled poultry. - 2014 rated 89 Vinous “This very clean, uncomplicated Cerasuolo drinks easily.” And also rated 90 points on Wine Review Online. Cryomaceration on the skins for 15 hours to enhance the varietal aromas, then vinification at controlled temperatures with selected yeasts.